Sphexa, Start Dinosaur – Robot Dinosaurs! Asha—Ash to friends—wedges the maintenance door open wide enough to slip into the darkened interior of the abandoned ride. Inside smells like rust and stale water and plastic fused with metal. The small robot bobbing behind him clicks, casting a circle of illumination on the concrete floor. He made Sphexa in shop class at school, patching together an old Echo, a frame salvaged from a drone, a rolling toy robot, and a few other things, because if you’re going to be that stereotype of the Indian kid good at engineering, you might as well lean all the way in. “Would you like a list of car rental agencies in the area that take last-minute bookings?” Disapproval is not something he programmed into the bot, but it’s definitely pulling some attitude right now. They’re walking alongside a long, low channel that still holds a few inches of scummy water. The flat-bottomed boats that used to rock and splosh slowly along the artificial river are long gone, of course. Journey Through the Jurassic was shut down a year ago, eclipsed by other, showier rides in the park. It was his and Mei’s favourite, before that. They rode it every hot, sticky summer, multiple times if they could, huddled together in the boats with their backpacks full of issues of National Geographic and Meccano dinosaurs they’d built together. Over the years, they went from staring awestruck at the animatronic saurians craning over them, to playing spot-the-anatomical-inaccuracies. Ash still remembers, though, that first time, when they were younger—though they’d ridden it so many times already by then—when they rounded the corner where the T-Rex lifted its metal head and roared in the low reddish light, and Mei grabbed his hand, their smaller, warmer fingers tightening in his. Mei. His heart jolts, as it always does, at the thought of their heart-shaped face. The way their hair is always falling into their eyes when they get excited about something, and how they dash it away impatiently with the backs of their hands as they keep talking, their voice going high and jumpy with their infectious joy. They had their first kiss on this ride too, in the back of a boat in middle school, somewhere just past the T-rex but before the raptors. Ash clambers through a thicket of fake Jurassic ferns and a nest of baby Maiasura, led by Sphexa’s overhead beam. It’s hot in here. His rented tux is a little too small for him, uncomfortably tight against his chest, over the binder. The corsage he got for Mei sits carefully in an inner pocket. He figured he should keep at least one thing traditional if he was going to flip double middle fingers at all the rest. He’s almost all the way to the mouth of the exit when the irregular silhouette of a Stegosaurus rises ahead out of the gloom. Ash grins. Bingo. Stegosaurus, Mei’s second-favourite dinosaur (their first is Psittacosaurus, but Journey Through the Jurassic doesn’t have one). Ash carefully lowers his backpack to the now-brighter floor and start pulling things from it: pliers, loops of cable, wire cutters, microcontrollers; mostly from his own workshop, a few ‘borrowed’ from his dad’s. His hopes are confirmed as he starts carefully severing the plastic encasing the animatronic’s upper forward leg joint. The T-connectors and needle valves he needs are mostly already there, articulated and ready to go, if dusty from disuse since the ride shut down and the Stego stopped making its plodding way back to and from the waterhole. All he has to do is feed wires into the right places, sealing them in places with dabs of insulated putty, winding them up towards the dinosaur’s knobby head. Mei had nearly cried with happiness when he’d asked them to prom, but had flip-flopped between anxiety and despair ever since, making lists of everything that could go wrong. They’d never exactly fit in, the two of them, the trans kid and the immigrant. Especially not since Mei had come out. Ash could guess what some of the stuff on Mei’s lists was: the glances in the hallway, the jackasses trying to flip up their skirt, being shoved at the water fountain. He got his fair share of it too. The Sphero that went into making Sphexa had been his before someone kicked it down the hallway, snapping it in half. Sphexa hovers overhead as he works, the minutes ticking by. 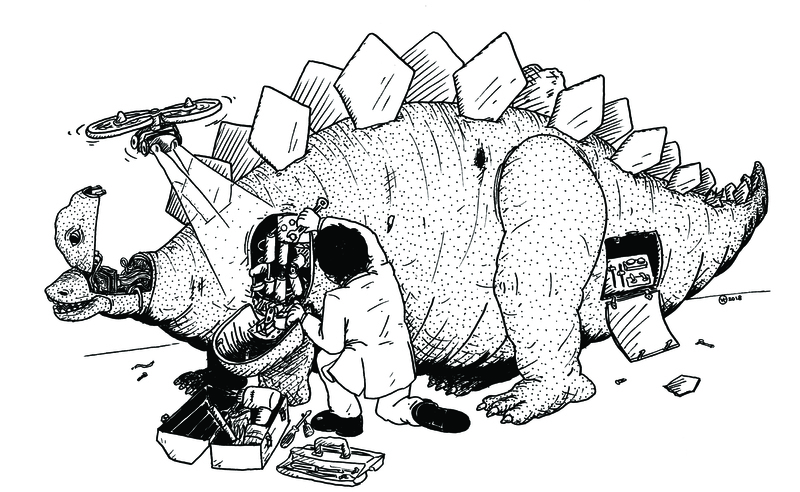 As he suspected, the Stego’s skull is mostly empty, its mechanics concentrated in the joints. Ash pulls himself up onto the dinosaur’s back, brushing cobwebs from between its raised plates—a staggered line of them, not paired, totally inaccurate for S. Ungulatus. At least it makes it easy to find a seat. Tablet in hand, he makes minute course corrections on the touchscreen as the robot levers itself into the hollow skull, clicking free of its drone frame. Ash leans forward to plug the final jacks into the ports on Sphexa’s back. Rotors click and valves piston as the connections light up one by one, a whirring hum he can feel through the automaton’s thick plastic hide. The Stegosaurus shifts, lifting one huge foot and then another, testing its restored—and expanded—mobility. Elation warms his chest. The illustration is by Vincent Konrad! 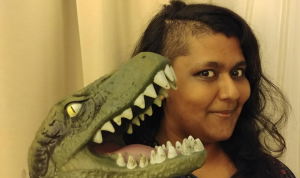 Posted in original fictionTagged fiction, Nibedita Sen, robot dinosaurs!